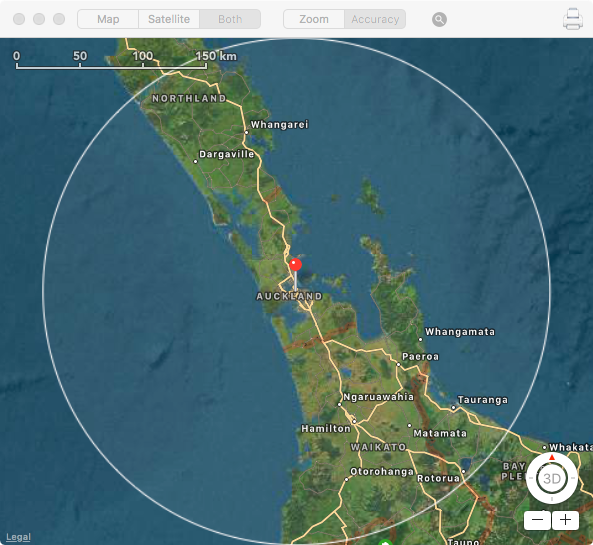 The Map Viewer uses Apple MapKit software to provide a detailed view of network locations. It is a self-contained viewer within WhatRoute and does not require you to run the Apple Map application. This screenshot shows a marker at my home network location and the region of uncertainty (the white circle) associated with that IP address. The toolbar contains three controls. The Map/Satellite/Both segment control will show a cartographic view, a photographic view, or a combination as in this example. The Zoom/Accuracy control provides a convenient way to toggle between either a close up view of the network marker, or zoom out to the extent of the accuracy radius. The Network marker remains centred on the map. The magnifying glass icon will reveal a slider control when clicked. This slider controls the zoom level for close up views. You can use the scroll wheel on your mouse to zoom closer for more detail or zoom out to see a more global view. You can click-drag the map if you want to look at an area outside what is visible. Clicking either Zoom or Accuracy will re-centre the view. The window may be resized to something more convenient.